This 2 page bench top reference provides a quick reference of the Equine Body Condition Score System. 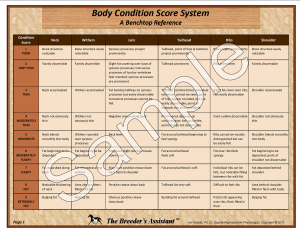 Side one contains the descriptions of each Body Condition Score (BCS) 1-9 in tabular format; Side two has a quick overview of the body areas assessed for fatness and representative pictures of BCS 1, 3, 5, 7 & 9. The laminated photo stock is durable & wipes clean easily.